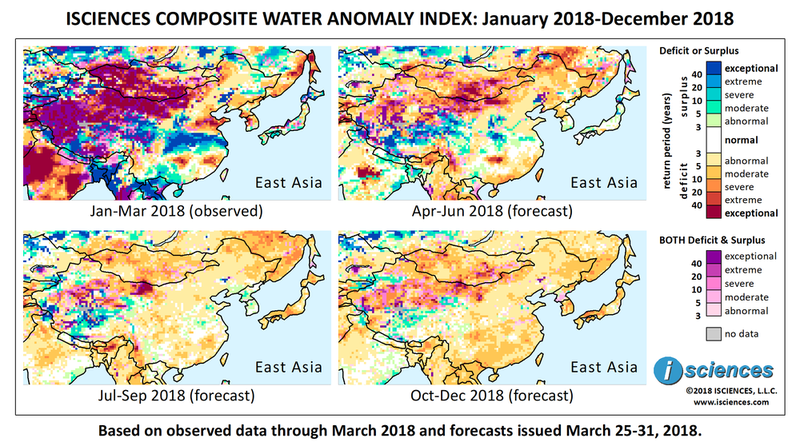 The 12-month forecast for East Asia (below) indicates widespread, intense deficits reaching exceptional severity in western Inner Mongolia, stretching west through Xinjiang and south into northwest Qinghai. Conditions of both deficit and surplus are also indicated for these regions as transitions occur. Deficits reaching extreme intensity are forecast across Mongolia, moderating somewhat as they extend into Northeast China. A vast stretch of Southeast China will also experience deficits, including Fujian, Jiangxi, Guangdong, and Hunan, where anomalies may be exceptional. A pocket of exceptional surplus is forecast north of the Bohai Sea in Liaoning Province near Fuxin; moderate surpluses are forecast for the northern lower and middle reaches of the Yangtze; and surpluses of varying intensity are forecast for central Tibet, leading northeast through Qinghai. Moderate deficits are forecast for Taiwan and Japan, and severe deficits are forecast near Seoul. The near-term forecast through June indicates that the extent of exceptional deficits in Mongolia, Inner Mongolia, and Xinjiang will diminish considerably, though widespread deficits of varying severity are expected. Moderate to severe deficits will increase in Northeast China, with some areas transitioning from surplus. Intense deficits in Shandong will downgrade to mild, and moderate surplus will emerge in the lower reaches of the Yellow River. Surpluses in the Yangtze Basin will diminish considerably though exceptional conditions remain in the forecast for the Han River Basin. In the Southeast, intense deficits will persist in Hunan and downgrade in Jiangxi and Fujian; moderate to severe deficits will emerge following the coastline and into Taiwan. Hainan will transition from surplus to moderate deficit, as will Guangxi. Severe deficits will emerge in western Yunnan. Surpluses are forecast for central Tibet reaching northeast through Qinghai, and in western Sichuan. Moderate deficits are forecast for much of North Korea. The forecast for July through September indicates that water anomalies in China and Mongolia will downgrade overall, though a large pocket of exceptional deficit is forecast for western Inner Mongolia. Moderate to severe deficits will persist in Mongolia, and primarily moderate deficits in Northeast China. Conditions in the Yellow and Yangtze watersheds will become nearly normal, some moderate deficits will continue to emerge in the Southeast, and surpluses are forecast to continue in central Tibet. Moderate deficits are expected to emerge in Japan. North Korea will transition from moderate deficit to moderate surplus. The forecast for the final months – October through December – indicates an uptick in the intensity of deficit in Mongolia and the extent of deficit in Southeast China. Severe winter conditions known as a “dzud” have resulted in the loss of more than 700,000 head of livestock in Mongolia. Extreme low temperatures and snowfall have affected 66 counties across 12 provinces. Livestock were already in a fragile state due to malnourishment from last year’s drought conditions that impacted 70 percent of the country, reducing agricultural production and desiccating pasture lands. Mongolia's 2017 wheat production was almost half that of the prior year and 40 percent lower than the average of the prior five years. China’s South-to-North Water Diversion Project saved Beijing from the capital's longest dry spell on record. From October 23, 2017 to March 17, 2018 the Beijing region received no precipitation. Most of the city's drinking water was delivered from the Danjiangkou Reservoir nearly 1,500 kilometers (895 miles) away via the largest water diversion project in history. The two working stretches of the project opened in 2013 and 2014 and can now carry 25 billion tons of water annually from south to north. Prior to the availability of diverted water, Beijing relied on groundwater pumping to supplement municipal supplies, resulting in local water tables declining by 1-3 meters per year, though the rate has subsequently slowed. Some scientists argue water stress in northern China has more to do with unsustainable consumption practices and that conservation and appropriate pricing could go a long way towards solving the region's water stress. The government is introducing new tariffs on imported water in nine of eleven water-stressed provinces. Weather modification on a grand scale could soon be used to address water scarcity issues on the Tibetan Plateau. China is planning a large-scale cloud-seeding project that could potentially increase rainfall across the region by as much as 10 billion cubic meters per year. The project involves installing tens of thousands of specially designed burning chambers to introduce silver oxide into the atmosphere, intercepting moisture from air masses moving into Tibet during the South Asian monsoon season. China is blowing up its rivers. With warming spring temperatures and forecasts indicating a thaw, local officials have moved to break up ice on 5 kilometers (3 miles) of the Heilongjiang/Amur River, China's northeastern border with Russia, using underwater explosives. The series of planned explosions occurred over four days in early April at key points along the river where ice-dams can form causing local flooding. The technique is not uncommon across China - in the past the military has dropped bombs on frozen rivers to break ice-jams. A drought in southern Taiwan is threatening agricultural production. As of mid-April, Taiwan's largest reservoir - the Zengwen Reservoir which irrigates southern farmland - was down to 9.26 percent of its effective capacity. The Nanhau Reservoir serving Tainan City's nearly two million residents was at around 37 percent. A recently concluded study determined that 212 square kilometers (85 square miles) of central Tokyo is at risk of flooding should a "super typhoon" comparable to one experienced in 1934 hit the city. Such an event could impact 4 million residents, nearly one-third of Tokyo’s population. The frequency of intense typhoons striking land has increased in recent decades due to warmer ocean temperatures, raising the likelihood of such a storm impacting the Tokyo region in the future.